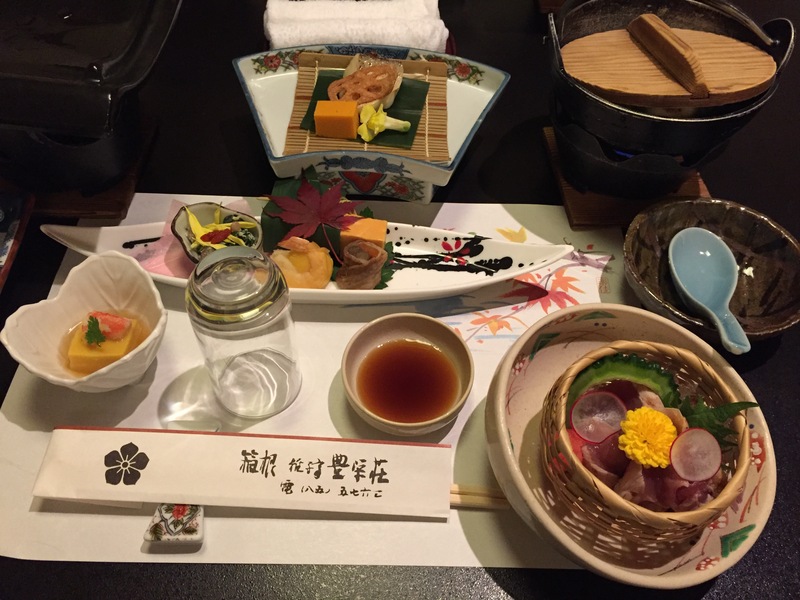 This is the second instalment of What I ate in Japan – read the first one here. After a spectacular rope-way trip over a volcanic valley, overlooking a bare mountain with thick steam rising from the surface, we made our way to our ryokan in Hakone, in the lush Japanese countryside. 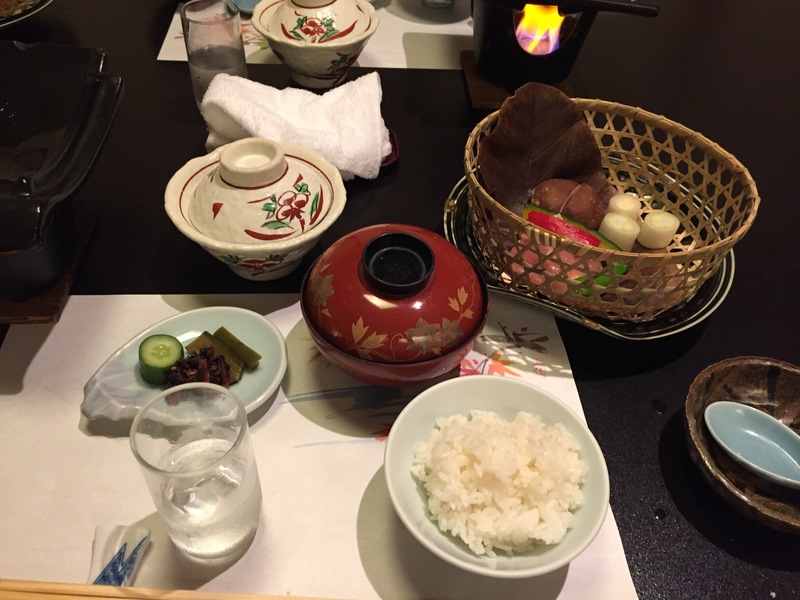 A traditional hotel, with tatami floor and sliding doors, the hotel also had a beautiful onsen (a natural thermal pool by a river, enveloped by nature) and a very gorgeous dinner served in our rooms and eaten on your knees (cramps). As much as the food was strikingly beautiful and perfectly constructed, it was bland. So, so bland. 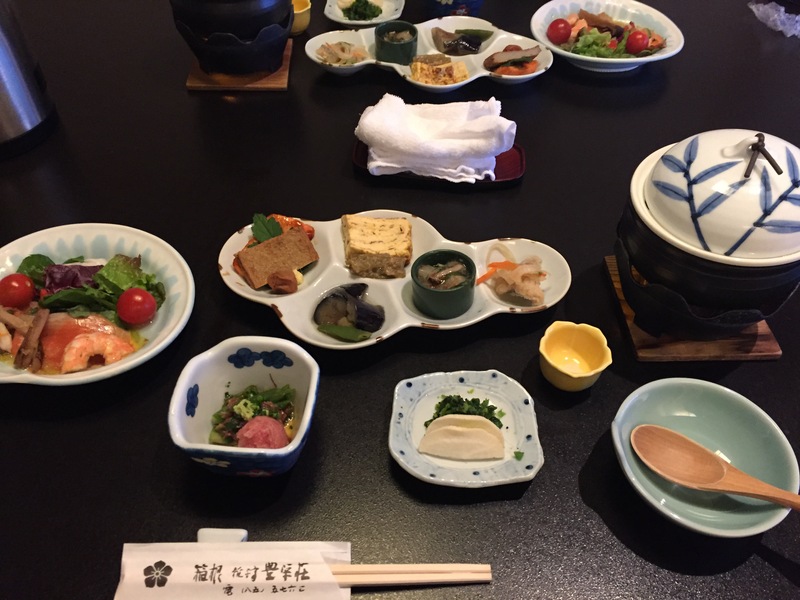 There was some sort of very delicate soup with chewy noodles and pheasant, squares of sweet omelettes and taro dumplings, boiled prawns, edible flowers, and pheasant sashimi. Yes. Raw poultry. Raw poultry dressed with radishes so thinly sliced they were transparent and edible flowers, but raw poultry nonetheless. I had all sorts of alarms going off in my head. I’m sure it’s fine, I told myself. Be adventurous. You eat raw egg all the time. You’ve had raw pork. What’s the worst that can happen? Curious to know what it tasted like? Me too. Because I did not have it. In fact, scarred by this near-raw-poultry experience, when served the phaesant table barbeque I cooked the hell out of it, until it was tough and barely edible. Sorry, phaesant, you died in vain. This barbeque course (below), also involved some unseasoned leeks, some unseasoned mushrooms, and a single unseasoned slice of pepper. There were some lovely pickles and rice, but you catch my drift – there was no oil, no salt, no soy sauce, no yuzu, no ponzu sauce. Ingredients were left alone to shine and fell flat. That being said, looking up reviews online I seem to be the only person in the world who strongly disliked this, so I believe it’s my fault. My palate is not quite delicate enough to appreciate a single warm (did I mention unseasoned?) leek. Breakfast was considerably better, with some grilled salmon browned and caramelised, a salad with juicy prawns, and warming miso soup and rice. 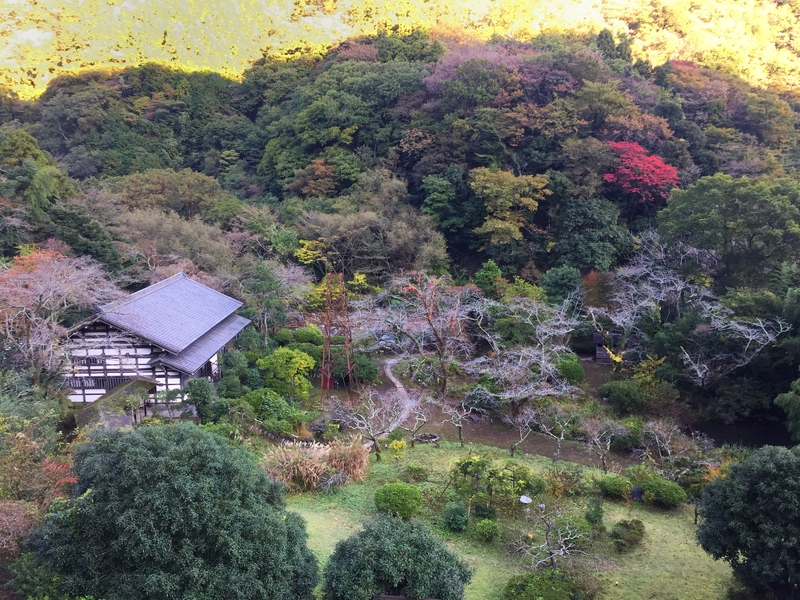 We took a bath in the enormous stone bathtub, hot water coming directly from the onsen, and enjoyed the view below. I thought I was familiar with the concept of a bento – essentially, a packed lunch. But bento boxes come in so many shapes and price ranges: homely portions of just-sticky rice with creamy curry, or beautiful wood-like boxes with a myriad of tiny bite-sides dishes each occupying their perfect little square. 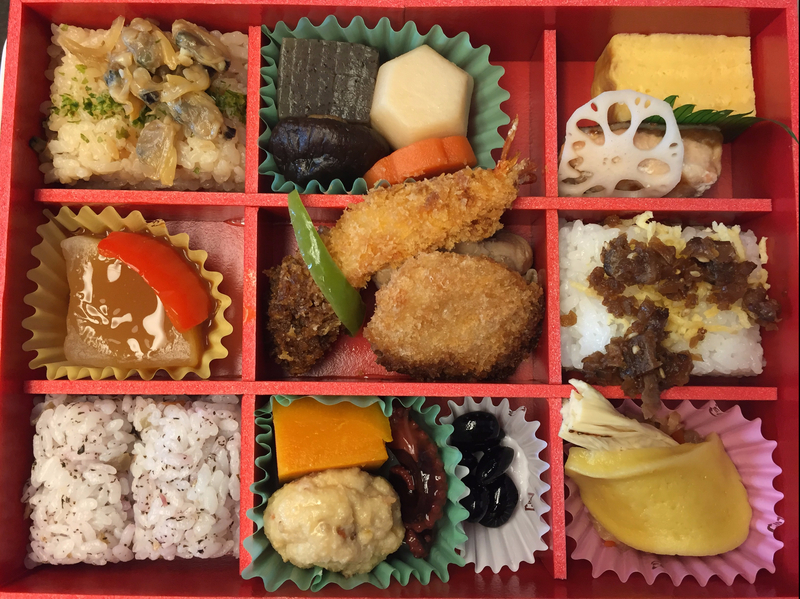 There are bento shops in every station, and the choice can be overwhelming, but they quickly became one of the highlights of our Shinkansen trips. The one below, which costed about £10, featured chewy taro dumplings, crunchy tempura prawns, savoury mussels on seasoned rice, a sweet, fluffy pillow of omelette served with fresh lotus root, and a variety of geometrically shaped elements which I could not quite recognise. But to me, bentos are all about the symmetry, the care for the detail, the dignity given to a train lunch. A world away from a ham sandwich and a packet of Quavers. Japanese curry, the mild, sweet brown gravy often served with pork cutlet and chubby chunks of carrot, bears such little resemblance to its South East Asian homophone, that it never occurred to me that they could even be related. In fact, curry was introduced in Japan by British Navy officers, who had adopted the dish from India. 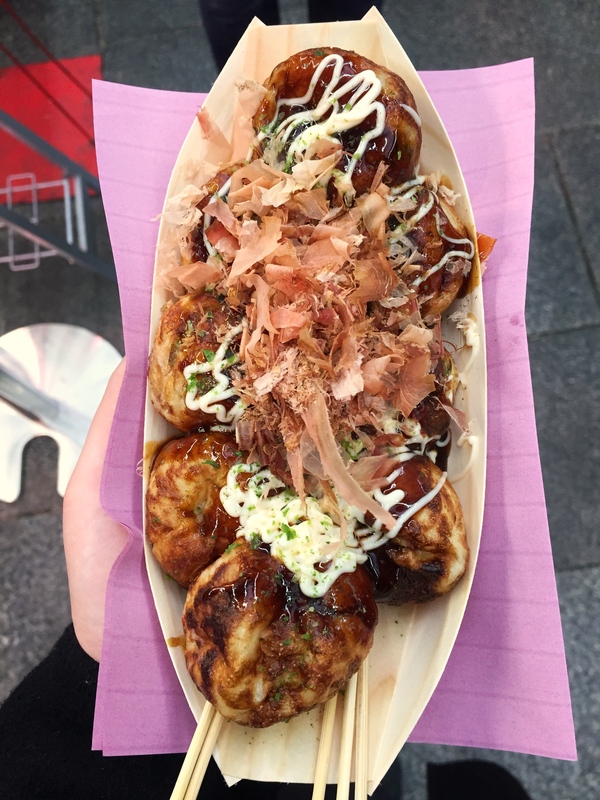 In its current form, it’s one of Japan’s favourite dishes and can be found pretty much everywhere. A few people had recommended CoCo Curry House, a curry-dedicated chain whose brown sauce is close to addictive. Their motto is “good smell, good curry” and you will not get it until you realise that a CoCo Curry joint mysteriously projects an enticing smell which betrays it every time. Once you recognise it you will always know whether you are in its proximity. 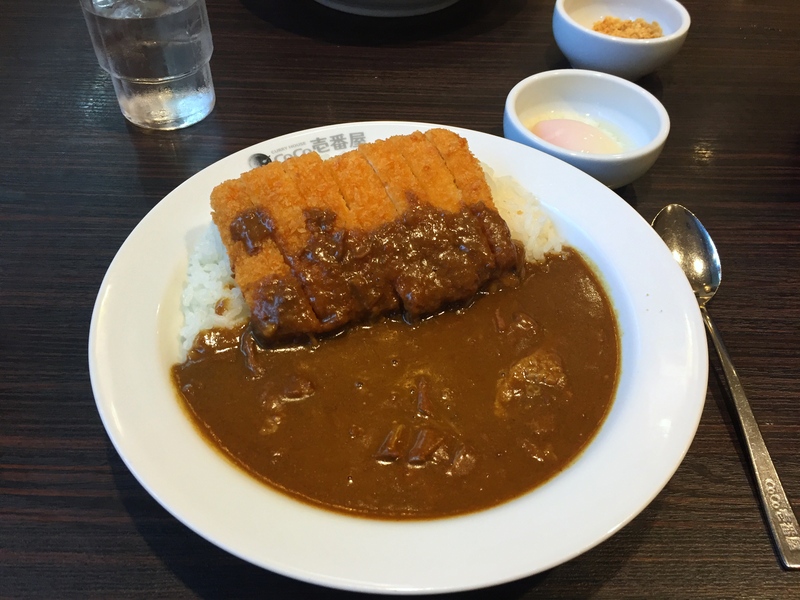 The curry can be made of chicken, pork or beef, and can be served with anything from traditional fried cutlets to frankfurters, fried cuttlefish, natto and even just cheese (it is a very, very long menu). Most aspects, such as sweetness, spiciness, and toppings, are customisable. Let’s talk about spice. I had never had a Japanese curry that was actually spicy before. Sure, it was spiced, but never hot. When choosing the heat level, looking for a hint of warmth more than anything else, we went for 2 out of 10. It was hot. Not painfully hot, but runny-nose teary-eyes swollen-lips hot. I’m not quite sure what a 10 would taste like, but I decided to keep that a mystery. As toppings, I particularly loved the soft-boiled egg, a quivery cloud of barely cooked egg, so borderline-raw that I wondered how they even managed to break the shell. I loved how the creamy yolk mixed with the dark pork curry sauce. I also liked the potent garlic bits, and the sweetcorn (a local obsession I unabashedly embraced during the trip). 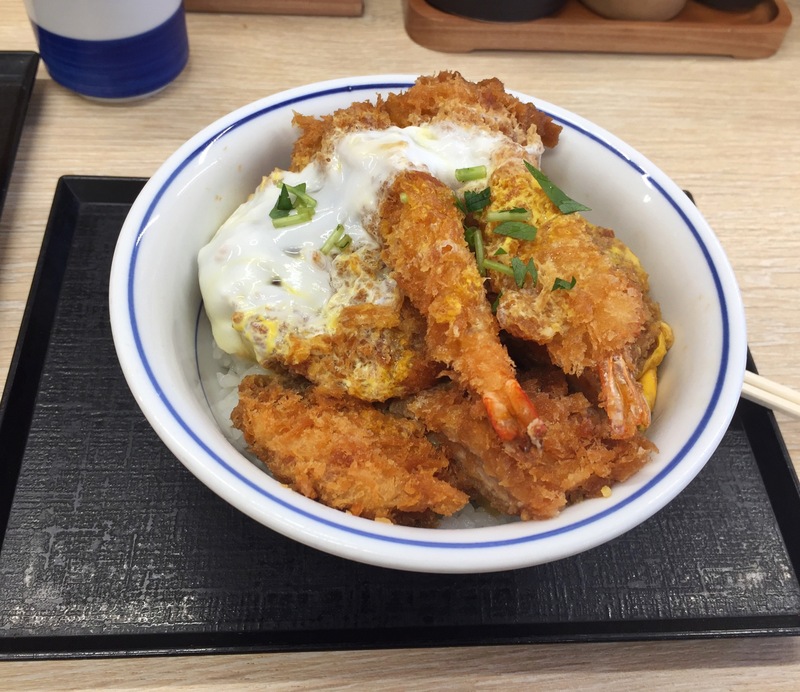 Or, fried stuff on rice with a barely-cooked egg (Japan really does not fear raw egg). This was from a small counter-only lunch restaurant full of people eating on their own while reading papers. I picked at random and received some huge, juicy prawns, pork and beef (yes – deep fried beef). The man next to me observed me for a little, a sceptical look on his face, then pointed to the jar of pickles, which I obediently added to my bowl. The acidity really lifted what is essentially, did I mention, fried stuff on rice. 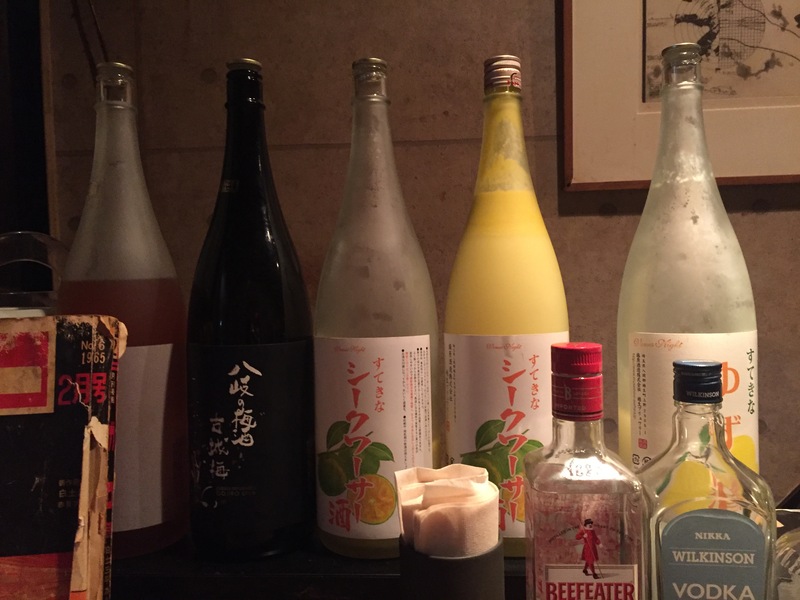 The perfect accompaniment to delicate flavours, sake is like a supremely clean-tasting white wine – a delicious palate cleanser between bites. 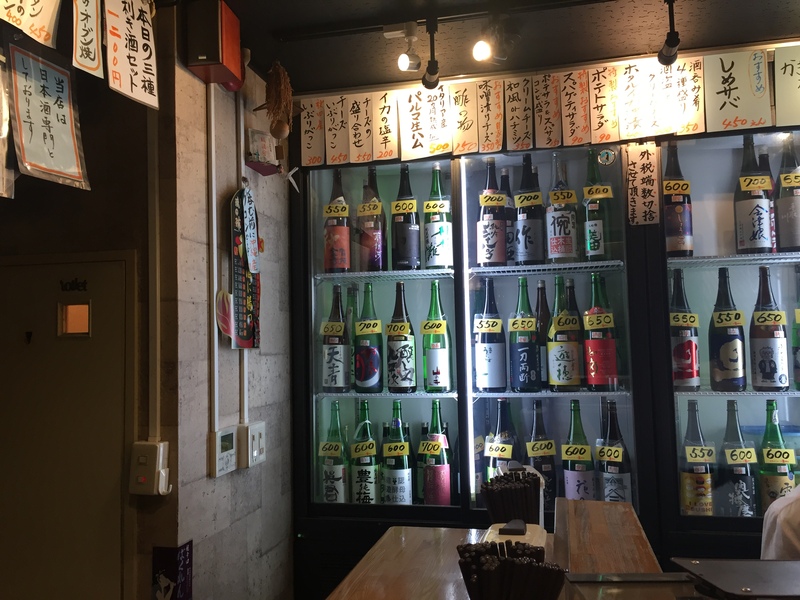 We had an incredible experience at Osaka’s Sake Bar, a beautiful standing bar with an impressive selection of huge sake bottles and an English-speaking bartender who asked if we wanted it dry or off-dry, medium or full bodied, and offered us glasses upon glasses of the stuff. 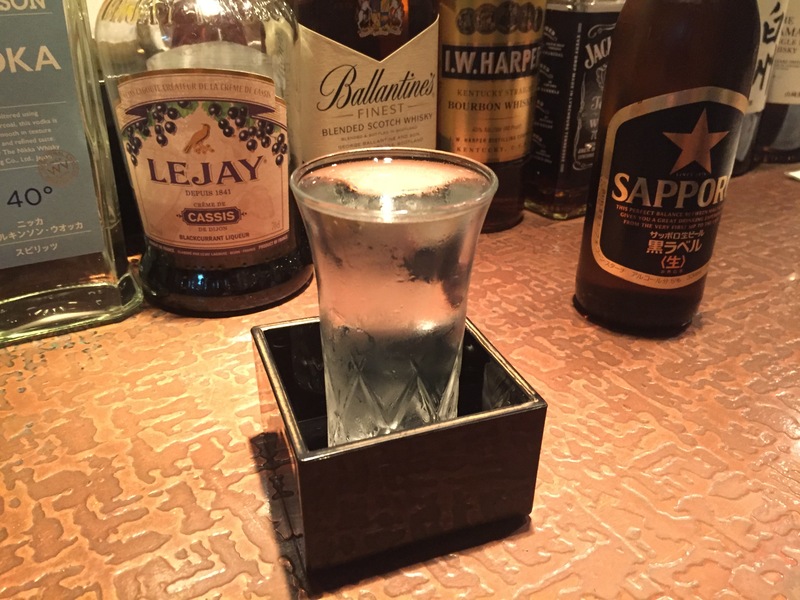 It was delicious, and I discovered I was partial to an off-dry sake as a nightcap. This is not, of course, everything we ate and drunk. We had disgustingly sweet matcha beers and whiskey highballs. 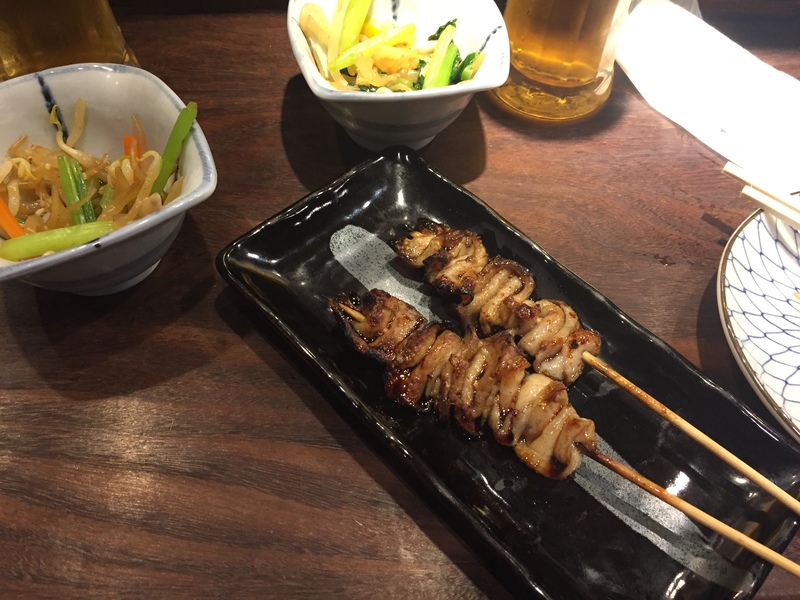 We ate fatty chicken skin yakitoris in the Golden Gai, drank beer in smoky hole-in-the-wall bars, had takoyaki in markets, thick sashimi in izakayas with ice-cold dry sakes in a wooden box. And we loved all of it.